‘Armpit. Your bread smells like a sweaty armpit’. You may have guessed, we’ve not quite got around to making our own dough yet. The bread in question is a commercially produced, foil packaged, supermarket loaf. Sealed to stay fresh for days on end, the limp slices within are soft, slightly sticky and rammed full of salt, sugar, vinegar and preservatives. The loaf is an imposter, incongruous in a classroom that is otherwise a temple to real baked goods. Bertinet makes his point by squashing a slice in his hand. It squidges back into a stodgy ball of dough. Not long ago, he says, a number of councils sent out letters advising their local communities against feeding sliced white bread to the ducks as it was so hard for them to digest. It bloated, and in some instances even killed, the poor unsuspecting birds. Did parents receive the same letter home, advising against using this bread in sandwiches for their kids? I’ll let you to guess the answer on that one. Maybe this all seems a little over-the-top, but it’s this enthusiasm for bread – and more importantly real bread made with good ingredients, with love and with time – that makes both Bertinet and his classes such a success. He’s a bread evangelist, a man from a country where bread is taken so seriously that the price of a baguette is regulated, and breaking bread marks the start of every meal. Bread making is an art form, but it’s one he wants to share; there’s no sense of superiority in Richard Bertinet’s skill, just pure passion. And it’s contagious. After a rousing introductory session and demonstration of his unusual kneading technique (I say unusual, apparently it’s fairly standard in French bakeries, but vastly different from the technique described in so many British baking books), we set about making our first batch of dough. It’s straight in at the deep end, and Bertinet’s hands-on approach means we’re soon slapping and folding, lifting and aerating the dough, walking it across our worksurfaces with little plastic scrapers and encouraging it into stretchy, silken balls. Some take to the technique quicker than others, but there’s plenty of opportunity to practice with two different doughs to make and a variety of shapes and flavours to try – simple slashed fougasse, cheese and olive breadsticks, foccaccia slick with pockets of fruity oil and a crusty white tin loaf. All of these need time to prove, but hunger is kept at bay with various edible interludes throughout the day– rounds of toast, buttery, golden stollen studded with rum-soaked fruit and(are you sensing a theme? ), a lethal concoction of rum-soaked prunes dropped into mid-morning cups of coffee or tea. The whole session lasts nearly five hours, taking us on a step-by-step journey through mixing, kneading, proving, shaping and baking our dough. With our loaves in the oven and the kitchen beginning to fill with the irresistible aroma of freshly baked bread, Bertinet finishes the class with flamiche, a quiche-like bread from the North of France filled with soft melting leeks and sprinkled with cheese. As it disappears into the oven to bubble and bake, we’re given one final lesson in how to arrange a beautiful bread basket, before sitting down to devour the fruits of our labour, accompanied by salads, meats, cheeses and dozens of jars of potted pickles and preserves. As we’re leaving, we have the opportunity to make some purchases from the kitchen shop. Buoyed with enthusiasm, my Mum buys an enormous block of fresh yeast and I start eyeing up the various cookery books, as well as a pot of little lames, perfect for slashing the top of a loaf. Richard Bertinet follows my eye, smiles and hands me a brand new lame and a packet of blades. ‘A present. I’ve had mine as long as I can remember. This should last you a lifetime little loaf’. This perfectly sums up the experience of baking with Richard Bertinet. His enthusiasm, his kindness, and his passion to change the way we think about bread, not just today, but forever. If my lame lasts me for a lifetime of baking, I love the thought that it was given to me by this brilliant baker, and that a little bit of his excitement about bread will be baked into every loaf I make. I’ve been baking my own bread for nearly a year, and with this course under my belt and 2012 fast approaching, I’d like to share some of the things I’ve learnt. If you’re not already a bread baking fanatic, or are only just starting out, I do hope some – or at least one – of these tips will inspire you; to make your own bread, to think about where it comes from, and to enjoy it as much as I do. 1) Real bread matters. Eat good bread and you will be happier, healthier, more satisfied and more fulfilled. No nasty add-ins (I’m talking E-numbers, preservatives etc, not lovely things like herbs, cheeses, spices and seeds) – just good, honest ingredients. 2) Good bread comes from good dough. It might sound obvious, but if you don’t get the basics right, don’t expect miracles to suddenly happen when you sling your loaf in the oven. 3) Good dough takes time. I’m not talking hours and hours, but you do need to allow time for your dough to rise, to prove, to bake. Too much yeast or too warm a dough will produce a crumbly bread that dries out quickly. Be patient, and you will reap the rewards. 4) Love your dough. Be gentle. Treat it like a baby. You wouldn’t pummel, push and knock about a baby, so don’t do it to your dough (ok, you probably wouldn’t dust your baby with flour and bake it in the oven, but you know what I mean). 5) Dough loves air. Whether you follow Richard Bertinet’s kneading technique, or adapt to your own method, just remember that you’re trying to get air into the dough, not knock it out. This will help it rise and create a lovely, light loaf. 6) The wetter the better, and stick to recommended ratio of ingredients in your recipe. If your dough seems sticky, don’t add flour, continue to work the dough and it will become smoother and more elastic. 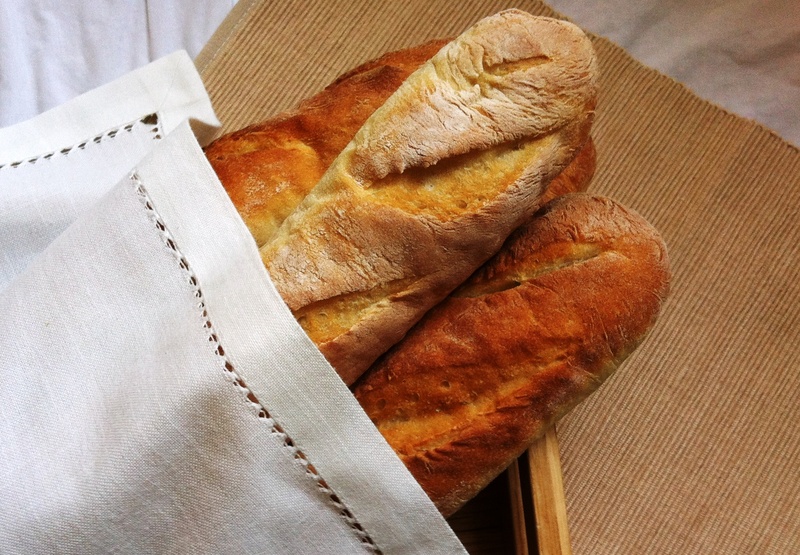 Adding flour simply makes for a drier, door-stop–like loaf. 8) When first mixing your ingredients, keep the salt and yeast apart. If they mix, the salt will kill the yeast and stop it from working. 9) Get your oven as hot as possible before baking, and use a water spray to add mist to the oven. This will help you to achieve the perfect crust. 10) And finally, have fun. Remember that while baking is all about rules and timing, some rules were made to be broken. I’ve read in a number of places that you shouldn’t slice a loaf until fully cooled – it’s still full of steam and slicing too soon can yield a denser, doughier slice. But I defy anyone, on occasion, not to tuck straight into a freshly baked loaf of bread, hot from the oven and slathered in butter. It’s one of life’s greatest, simplest pleasures. Looks like you had so much fun! I started getting back into bread in the summer and I got really into it. I will admit sometimes I use the breadmaker but I do tend to use fresh yeast because I can get it at Morrisons. I do love hand making bread though, putting my all into the kneading and seeing how the glutens relax is really rewarding! I’ve got a 2 batches of focaccia in the fridge marinating it herb and garlic olive oil which I made last night! I really want to go on the Bertinet bread course, it sounds amazing! Bread is definitely my baking weakness so I think I would learn loads – your tips are really helpful too! I am a huge bread fan too. Am going on a course through The Real Bread Campaign myself in January. It is designed for teachers and I am hoping to be able to teach adults bread making once I am fully qualified . I would love to go on a course by Richard Bertinet too but Bath is a long way away from me! I love making my own bread! And great tips. 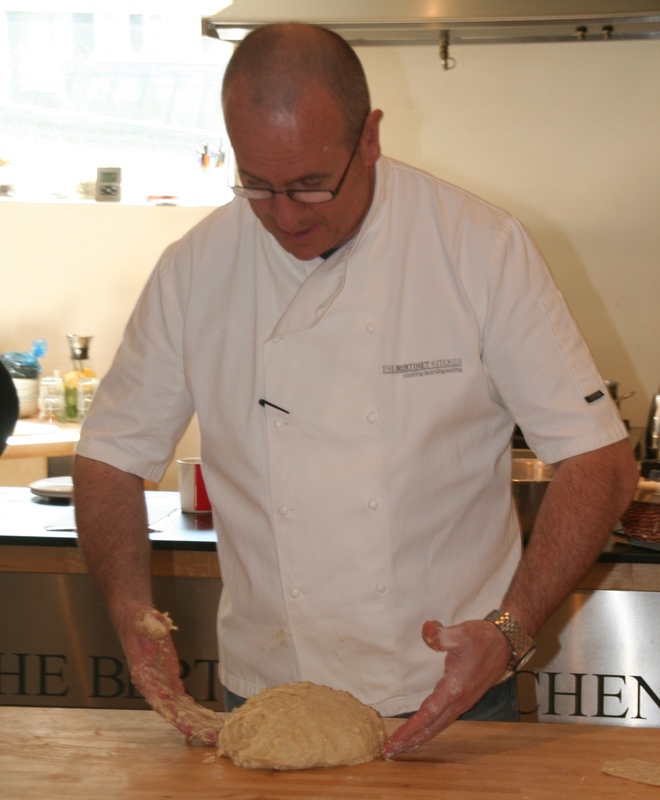 I did find it unusual when I was told by one baker that dough liked being slapped around! Anh – what’s not to love? 🙂 glad you enjoyed the post. Becs – that focaccia sounds delicious! I can’t get fresh yeast in my local supermarket which is really annoying, but I know the bakeries in big Morrisons and Sainsbury’s tend to give it out for free. Nelly – thank you. And I know, his technique takes a bit of getting used to, but it really does work. Lorraine – you do need to slap it about a bit, but only to get the air in there. It just shouldn’t be prodded and flattened like so many old fashioned baking books suggest. have you really only been baking for less than a year? that’s amazing. Great post and tips. That course sounds amazing. Great post! I have been wanting to try breadmaking for a while now. I will be sure to refer back toy our handy tips when I do! Kathryn – it was absolutely wonderful, would recommend it to anyone. Purely Food – hope they’re of some help! And yes, the course was fab. Rosa May – thank you! Very refreshing post. I enjoy your way of writing, your humor. Good bread needs lots of love, if u dont have fun making the dough u might get a bad end result. I agree to that, my cooking teacher wouldnt, it was more all about speed for her. Oh, real bread is so extraordinary and one can’t even say that it is better than packaged – there is just no comparison. What a fabulous experience you had and I would love to spend 5 hours with this brilliant man in a kitchen making bread. Wonderful experience and wonderful post! Thanks so much for sharing all the tips and advice! I’m so facinated by the whole experience of bread making. It’s so rewarding. 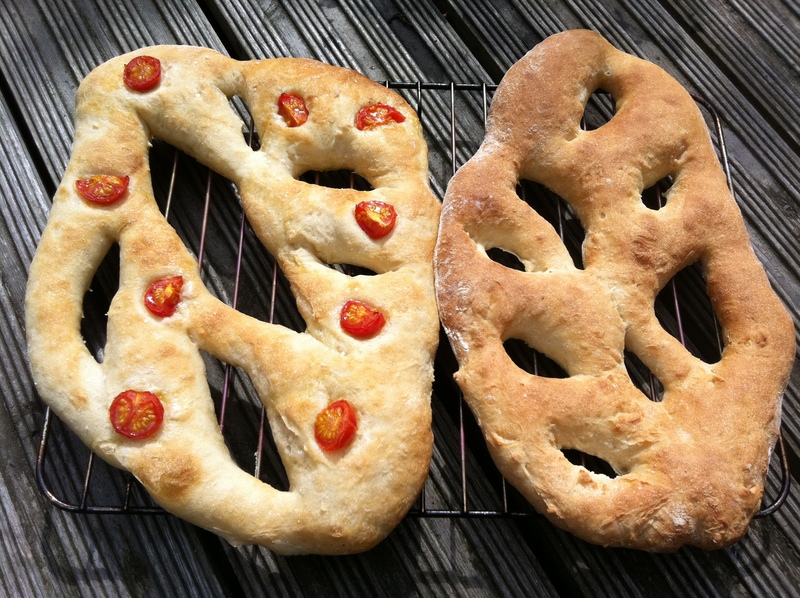 I need to try and make a fougasse someday, I’ve always loved those. Sounds amazing – would love to do this course and thanks for sharing the tips from the course – all very handy. 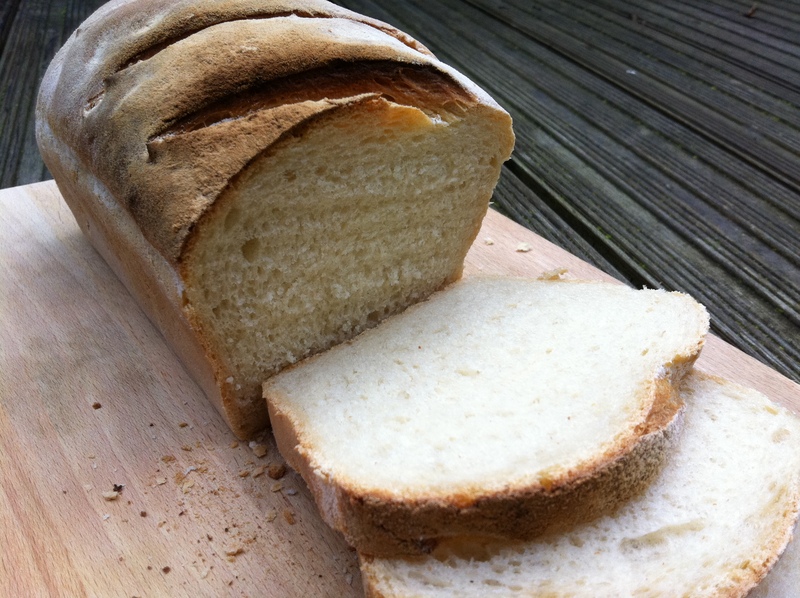 What a great bread post – you’ve given me so many ideas for breadmaking over the Christmas holidays! I love making bread, and I am going to go and grab my sourdough starter and give it a little love for breakfast tomorrow. I usually eyeball everything and when the dough feels right then the loaf is is usually just right. Works perfectly for me, but means I can rarely blog bread recipes! Currently getting to grips with using my Kenwood mixer for dough, it is very different. This is such a handy post! As you know, I’ve only recently started baking my own bread so I still have loads to learn and this is really helpful 🙂 The bread making class sounds really fun too! That just made me want his book, Crust even more! Thanks for adding the link to the Guardian video! That must have been an unforgettable experience. I also make my own bread but I still have so much to learn….! Helene – I think your mood and attitude definitely go into whatever you are cooking or baking. A little bit of happiness folded in never hurts! Jamie – real bread is so incredibly important – it’s delicious, healthy and just a million times better than anything you can get out of a packet. Sylvie – fougasse are lovely, although if I’m honest there are probably more exciting breads you can make with the same dough. Gourmet Chick – glad to be of help! Katy – thank you. Happy baking! Helen – I’m getting a Kitchen Aid for Christmas and am intrigued to try the dough hook…could be a whole new era of bread making for me! Julia – hope the hints help and happy baking! I stumbled onto your blog from another one and what a cracker it has turned out to be! I love the way you have written this post; your convictions, belief’s and passion comes through so evocatively. It could be the Bertinet effect, but I’d like to think it’s your love for your medium too. Ah, thank you. I have a copy of Dough which is brilliant for basics, but would love to buy Crust too – it goes a little more in-depth and has some of the more complicated pastries etc. I’m so jealous of you! Bertinet is my hero, ever since I bought “Dough” last autumn. It has totally revolutionised my breadmaking. I live only 40 miles from Bath so I’m hoping to go on one of his courses one day (thinks to self: drop hints to husband about presents for upcoming birthday). It sounds like the experience would be even more amazing than I imagined. Euan – I know, he’s such an inspiration! You should definitely try to go on his course if you can – he’s such a good teacher. Although your baking skills seem pretty good – maybe you should go on an advance course?! Now that I have read your take with dan lepard and Richard bertinet. Which is your choice of making a white loaf best? Great post. Brought back lovely memories as I was lucky enough to do RB’s 3 day course back in 2009 covering basic, French and Italian breads. His enthusiasm for dough is contagious and has a great sense of humour. I can’t remember when I last bought a loaf since attending this course. Currently making lemon and Rosemary focaccia, cranberry and pecan, everyday loaf using lovely Cotswold crunch flour (a recent discovery) and pitta. Going back to Bath in June to do his pastry course. Can’t wait! what a wonderful explanation of Richard Bertinets method of kneading. I found a video of him, probable his first one -he had hair then – it was about 4 years ago I was just starting to make bread but found the ‘old’ way of kneading was impossible as I have arthritis in my wrists and hands so tried his way and it’s so much easier. I also make my bread with a sponge , left overnight before adding more flour and water – so its real wet……. but with RB’s way of kneading it comes together beautifully. though it wasn’t until recently that I have learnt how to mould the dough after it’s rise before putting it in it’s tin or boule. That’s an RB video as well – with NO hair…….!! Just wish I could go to Bath for a lesson. AAAHHHHhhhhhhhhh well I can dream can’t I. The secret of good bread is good flour. 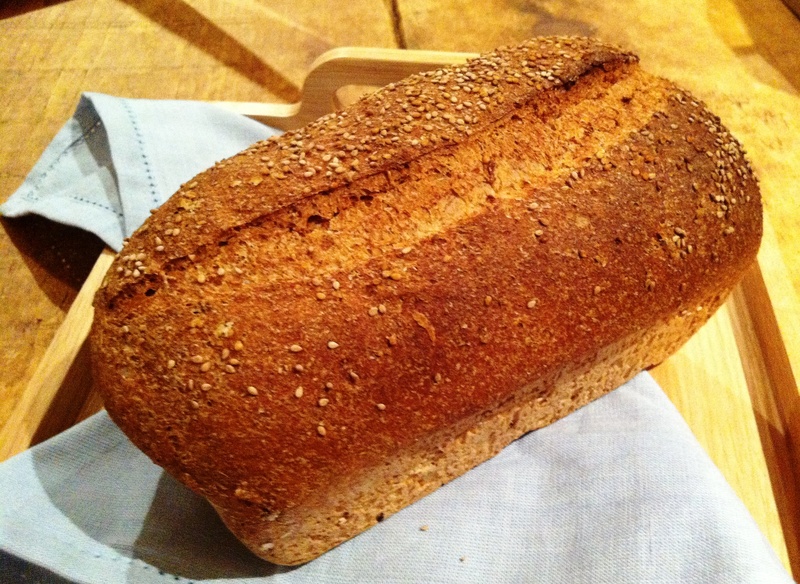 Richard uses Shipton Mill bread flour, which makes a huge difference. Hard to find, though you can get it via Amazon. Shipton Mill also do breadmaking courses, it’s very close to Slimbridge wildlife place. You get a tour of the mill, which I found fascinating.